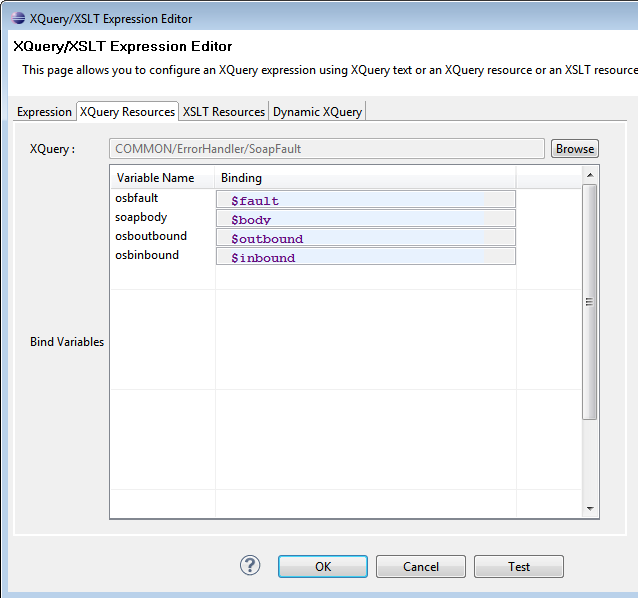 Example how to use XQuery in the Oracle Service Bus to perform a for-each-group function to change a flat dataset of records in a grouped recordset sorted on a unqiue value using the XQuery distinct-values function. access the database through the fn-bea:execute-sql() function. 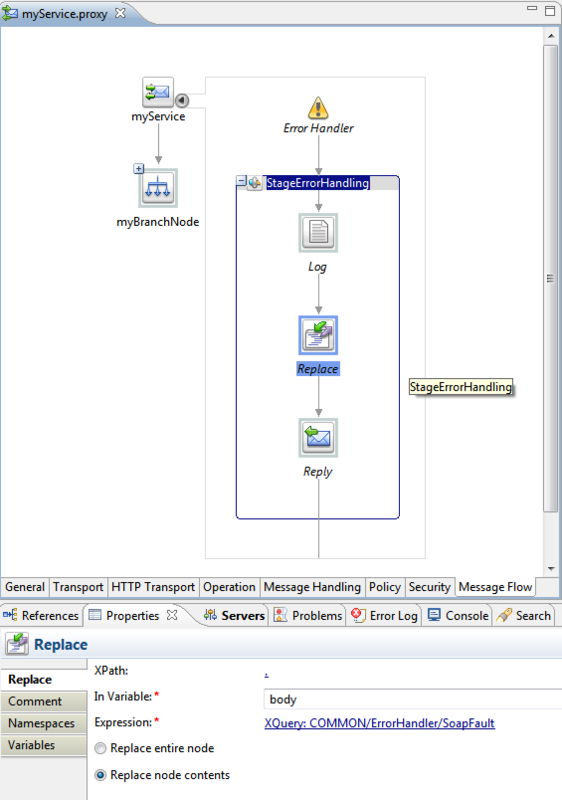 In Weblogic we create a datasource, use jdbc/nvp_ds as JNDI name and target it to the correct OSB managed servers. Then in our OEPE (or Notepad++) we create the following XML schema and use it in a WSDL as a nice datamodel for our soon-to-be function. 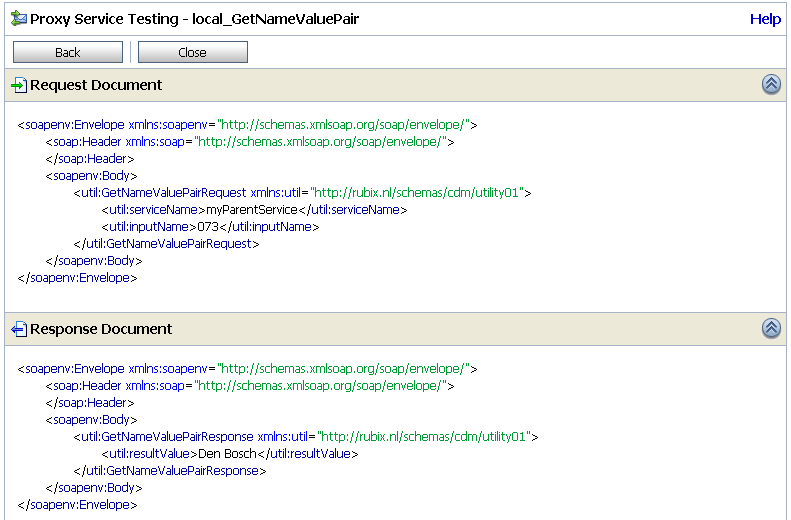 As you can see the 2 elements for request and response are simple and logically match the database columns. The resultXQ function which does the XQuery transformation uses the custom funcRBX:runSql function (don’t forget to declare the namespace). This runSql function performs the following steps. First we concatenate the SQL-statement we want to use to run against the database. We do this to prevent some weird typecasting problems which can occur with the execute-sql function. This is an example XQuery which uses 2 simple custom functions and the fn-bea:lookupBasicCredentials to retreive information from a Service Account in the Oracle Service Bus. This to prevent the usage of cleartext passwords in the Oracle Service Bus. declare namespace funcRBX = "http://www.rubix.nl/local"
To many times in Oracle Service Bus projects the design and creation of a generic soap fault error handling mechanism which is re-usable by all proxy services is forgotten. With this post I first want to show quickly what can happen without a decent soap fault structure in a project. And then show a basic soap fault mechanism which I often re-use in projects. First some examples (also explained in more detail by Eric Elzinga here). A proxy service with this basic Error Handler will log the $fault and reply-with-failure. However for technical (I will define these later on as runtime) faults in the OSB, the Error Handler will not alter the $body content and simply returns the same request message $body content. See below example for a response with a slightly altered and sabotaged request. This means that the service consumer gets no SOAP Fault structure from the OSB and would only be able to determine due to the HTTP 500 transport error that something is wrong. 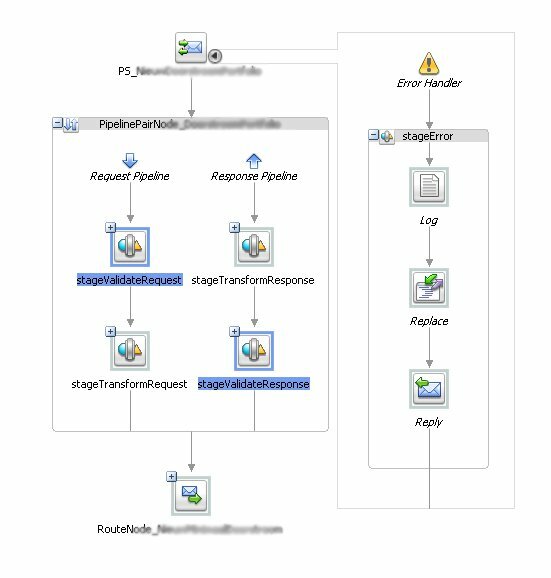 Weblogic logfiles will show the runtime $fault which is logged by the Error Handler, but this usually can only be monitored by Administrators. So enough with the examples and lets continue with a solution. In OEPE we need add 3 files in the OSB Project. The reason the 4 variables are completely send to the XQuery as input is due to the fact that it will be used as a generic component for all our proxy servics. With future enhancements you will have all information available to add more custom logic. There is some small remark to the namespace used in the <faultcode> element. If you validate the response you can detect that if your response message uses a <soap-env> namespace and you static use “soap:Server” in your response it will not validate. The prefix should be a valid namespace prefix in the message. For that reason I use a full namespace definitition in the <faultcode> element just to be sure. Another option is the use of this code, but I haven’t tested it yet myself in production. 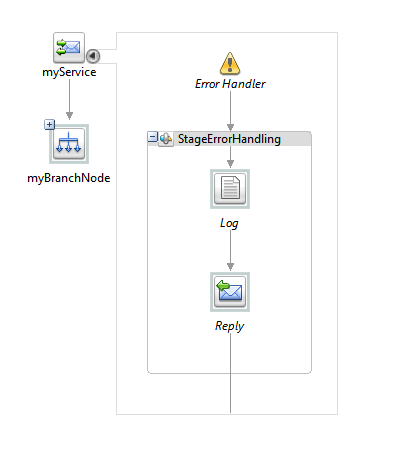 So we deploy/publish the configuration to our OSB server and execute the request again. faultcode generated in XQuery due to BEA-38205 errorcode (means a Validate error). Check SOAP specifications for reason and other possible codes. 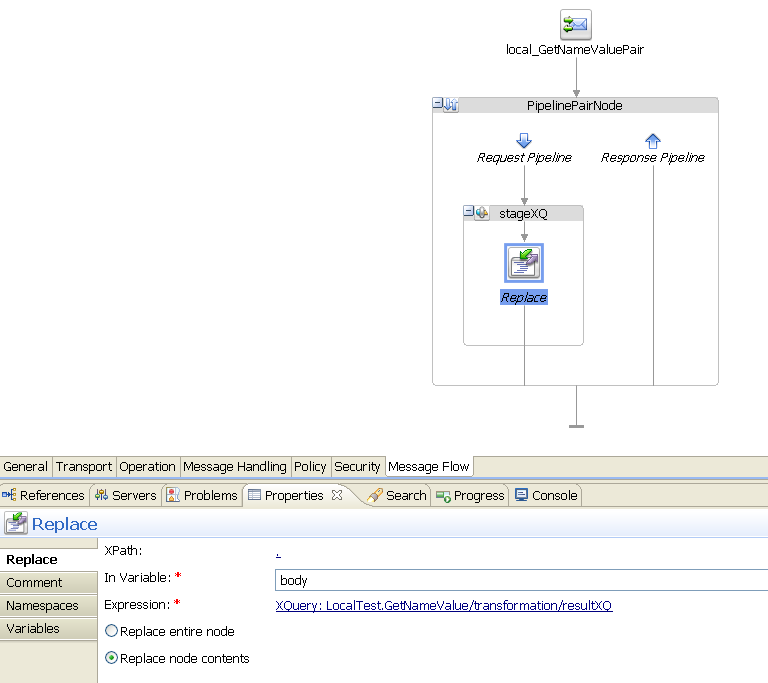 According to your needs you can alter the SoapFault XQuery and extend it with all sort of additional logic. I’m interested in feedback so leave a comment if you see issues, improvements, etc. Since I’m on a roll with Xquery functions let’s add an addition. Especially since the earlier example is a bit large for people looking for a simple example. So maybe this helps better to get an understanding. After working with Tibco BusinessWorks for some years I used a lot off the internal tib:functions supplied out-of-the-box and always found it a disappointment that Oracle (read BEA here) didn’t offer such a nice catalog to help you out. So over time I added a lot off these functions to my own library. For example the function if-absent helps me to prevent all these “is-value1-there-then-use-it-and-if-not-i-want-you-to-use-value2” checks. >In our project when an error occured the following Error structure must be returned to the service consumer. The limitation here is off course that the real description (the $fault variable) is not visible for the service consumer. Since the $fault contains an XML-structure we need a mechanism as CDATA to encapsulate this in the response message. So we used the above solution with a Replace action in the common Error Handler. In our data model the element is repeating so we made a choice to add a second element. The bea-serialize function helps us to transform an XML input to a string output. Apparently there has been an update to the XPath Expression Editor in the OSB since the editor in 11.1.1.3 now automatically sets the CDATA definition. Anoter solution would be to use XQuery in the error handler and the use of a namespace stripping function (as described here by Marc Keldermann) to clean-up the result of the $fault/details.